My first boat for wildlife photography was a Carsten "Puddler", and this was my first attempt at designing a camouflage cover for a boat or kayak. 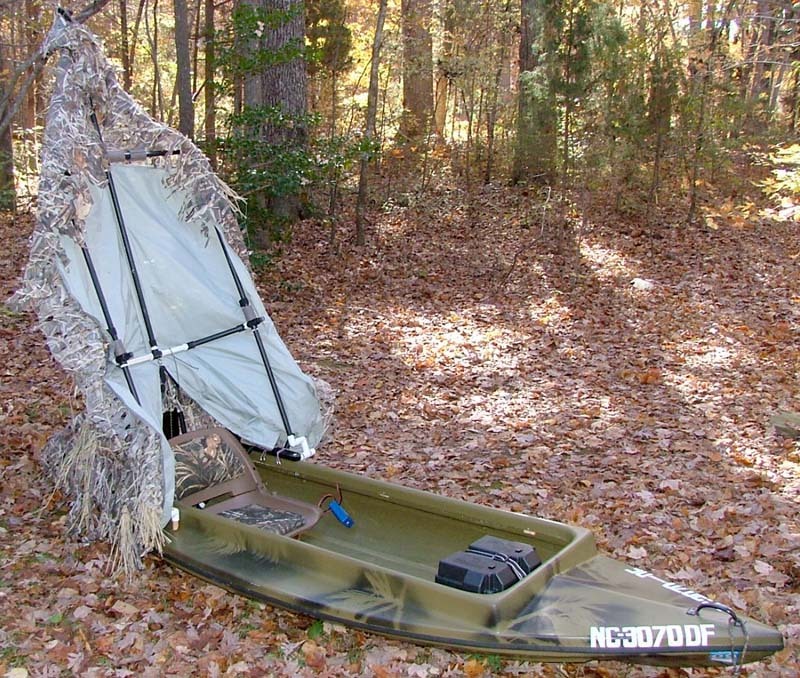 The concept and techniques used to make this camouflage cover are applicable to most any small boat used for the purpose of getting close to birds and animals in the wild. 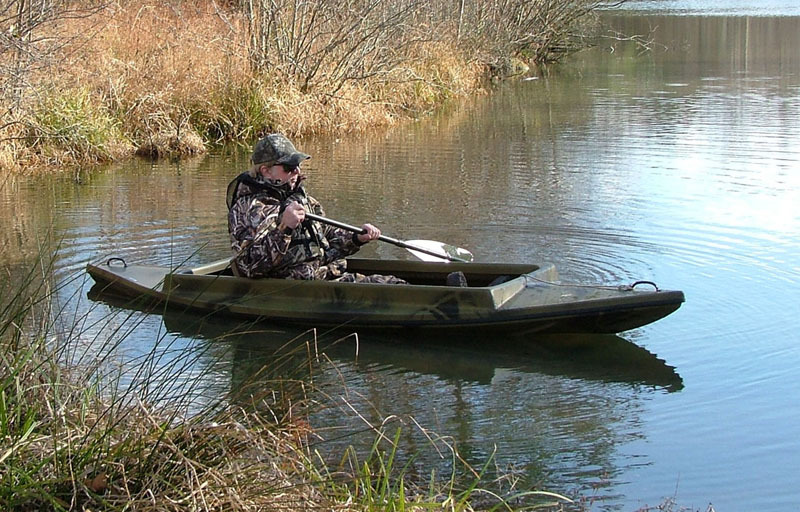 With some intelligent adaptations it could work for a john boat, a canoe, even a kayak. And I guarantee that it's a LOT cheaper than commercial boat blinds. 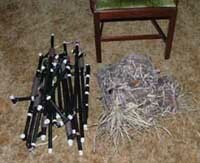 The photos below show the "frame" I made to drape my camouflage cover over. I used pvc water pipe and fittings (the thinner-walled 300psi pipe works fine for this). Everything is press-fit into the various connector fittings ("T's", 90° and 45° elbows, "cross" joints and end caps). Tubular foam type copper pipe insulation was slipped over the pipe in strategic spots to avoid the noise of pipe bumping fiberglass. Once everything was cut and test fitted, the joints which would not need to be taken apart later were locked together with a small screw. This minimizes the chances something will slip apart in use. It also simplifies and speeds up the assembly/disassembly process. Joints that needed to come apart in order to assemble and disassemble it for transport and storage were left alone. No pvc cement was used on any of it. The pieces will press-fit together quite sturdily for this application. All joints that were not screw-locked were then masked with a piece of masking tape, and the frame received a light coat of black acrylic spray paint to make it less visible under the camouflage cover. The taped joints were thus left white, which quickly identifies the joints that "come apart", so I'm not tugging like an idiot to separate two pieces that are locked together. By the way, by using screws instead of pvc cement, I can easily remove a screw and disassemble any joint if I want to modify the frame later. 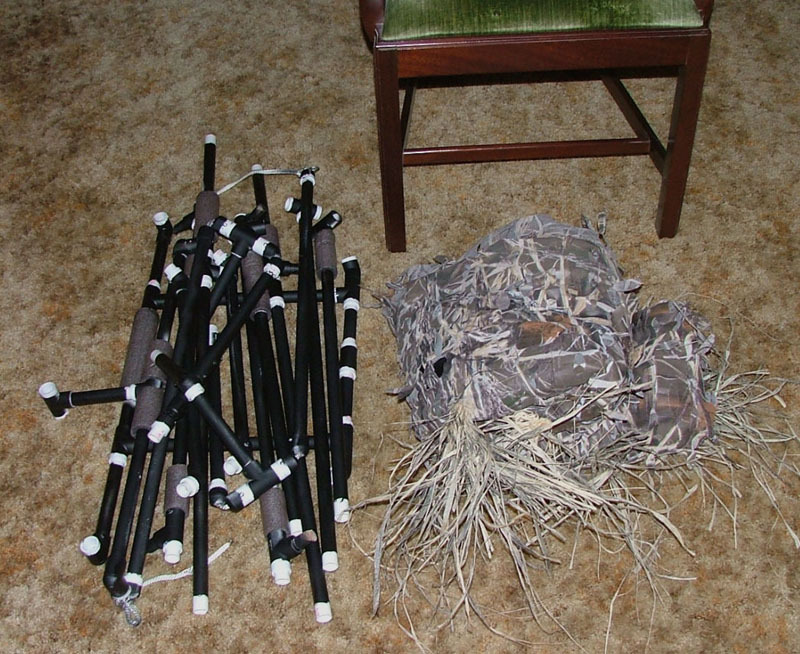 The left photo here shows a test fitting of the camo cover before adding the additional details. 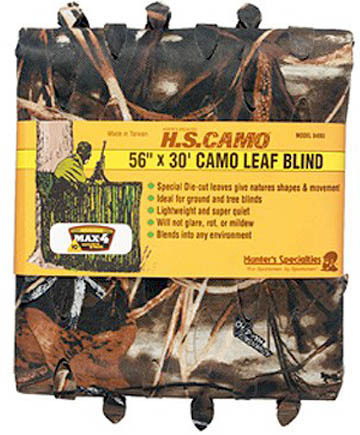 The camo material used is a commercial product made by Hunter's Specialties called H.S. 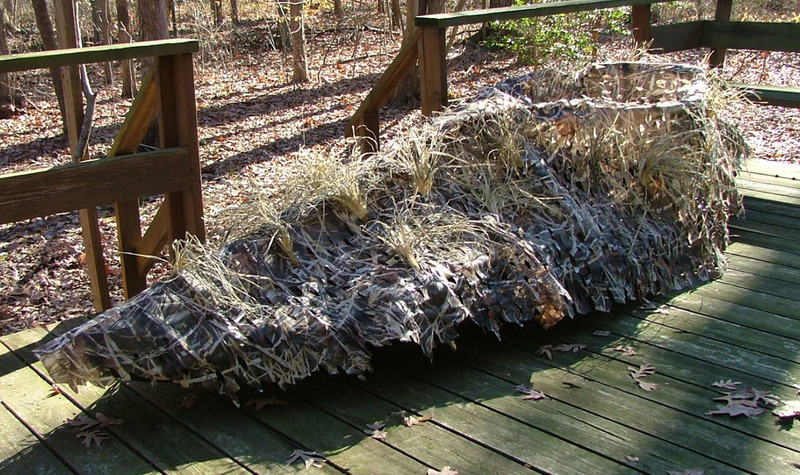 Camo - 56"x12' Camo Leaf Blind (product model # 04092) in the "Advantage Max-4 HD" pattern, that simulates a grass-type environment. It also comes in a 56"x30' pack (#04093). This works great for fall and winter camouflage along the shores of marshes, lakes and ponds. It's a polyester fabric which weights virtually nothing, doesn't soak up water, dries quickly, and is pretty tough. It's easy to sew with a sewing machine, and the 4.5x12 foot pack (about 1.5x3 meters) was only $13.00, though I've seen it priced as much as $25.00 (the 4.5x30 foot pack is about $30-$35). One Caveat: I must note here that the "Camo Leaf Blind" product is susceptible to deterioration from exposure to ultraviolet, salt water and weather in general. After occasional use over a three year period I found that the material used for the boat cover degraded into the consistency of heavy paper, and tore apart easily. I was not aware of this when I started using it. However, because of all it's other great characteristics, not the least of which is it's unequaled camouflage qualities in the Advantage Max 4D pattern, I do and will continue to use it for my projects. I do this with the knowledge that I will likely have to replace items with a newly made version after two or maybe three years of use. DO NOT expect this material to hold up if left outside in the elements on a continual long-term basis. 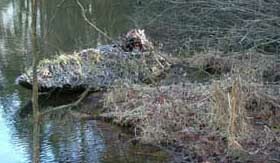 The camouflage material used. 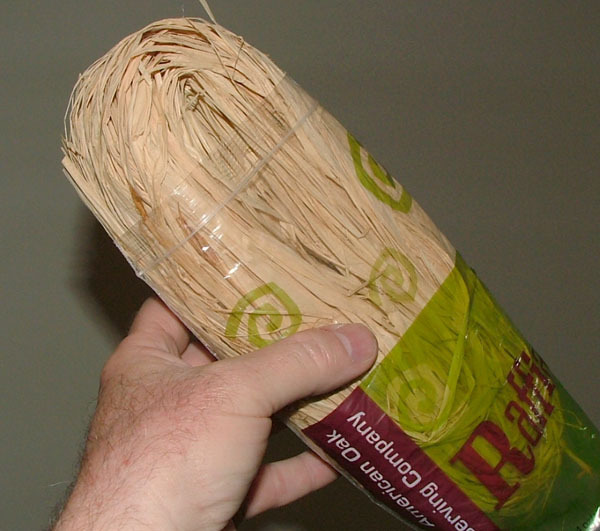 A package of rafia. A dozen small loops were sewn to the inside of the cover in strategic spots. 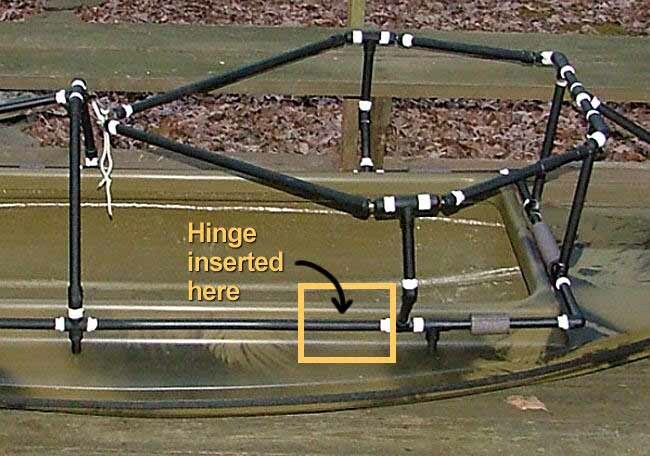 These loops slip over the pipe frame during assembly and keep the cover from shifting or flapping in a breeze. As you can see, the cover is not pulled taught, though it is secure. I was afraid a taught cover would diminish the natural look. Then finally the finishing detail was added to the cover. The upper right image shows the cover after some homemade "tufts" of Rafia were added for additional 3D effect. As for the other materials, I used a single package of Rafia (about $3.00 or $4.00 if memory serves me right) from the craft section of Wal-Mart. All the pvc tubing and fittings, and a pack of screws, came from a hardware supply and totaled around $10.00. I already had a couple of half-used cans of flat black Krylon spray acrylic on the shelf which sufficed for the frame painting. The partially disassembled frame and folded cover (shown at left) make a small package, altogether weighing perhaps 3 pounds. The frame sections will in fact breakdown into even smaller, shorter sections, and can be rolled up inside the cover material if desired, making a lightweight, easily portable package (the dining room chair in the photo is for size comparison). 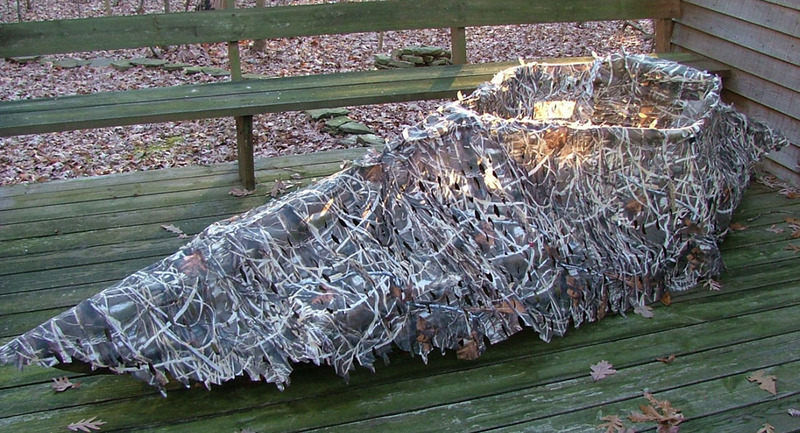 The photos here show how well this simple, inexpensive camouflage cover works. I was not wearing any camouflage gloves or face mask for these photos, though I was using a homemade camouflage cover on the camera. 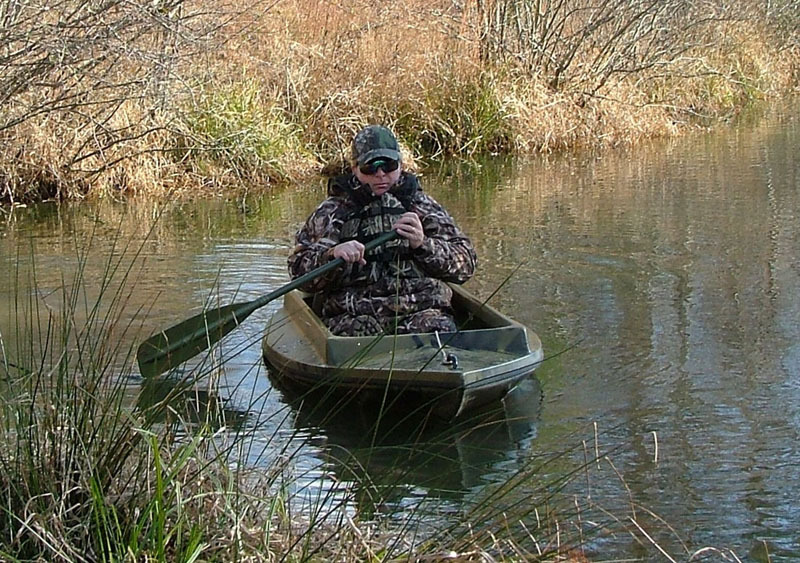 My head was covered with the hood of a camouflage rain jacket, which I wear along with a camo life-vest, and camo rain pants, the latter being mostly for keeping my legs from getting wet from the paddles dripping water. 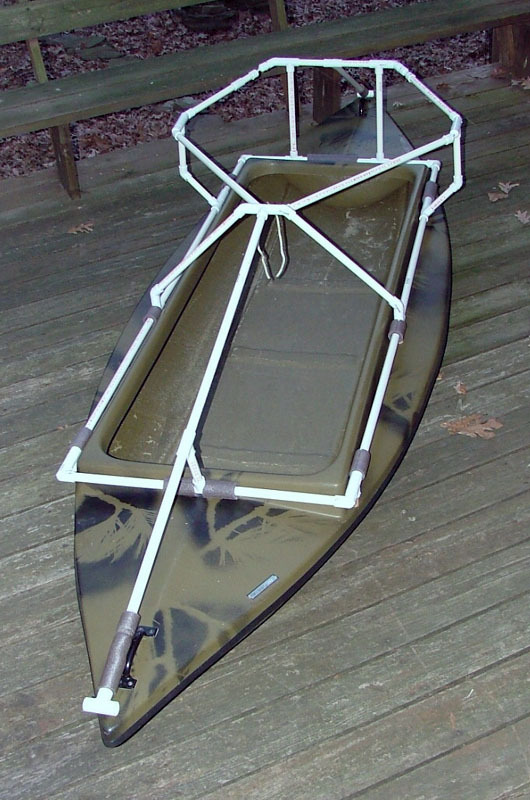 The sides of the frame around the "cockpit" will detach and lay in the boat, which allows the camo cover to collapse under my arms. 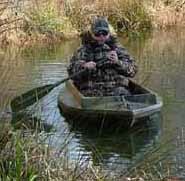 This facilitates paddling, as shown in the below left photo. This is one of those details of construction that I have not gone into deeply. If there is interest, I can provide more explanations and photos with details of the design and construction of this camo cover and frame. After this initial trial of the cover I was quite satisfied with the whole concept, except for one small detail. I realized getting into and out of the cockpit opening was much trickier on water than on land. I devised a hinge for the frame which allowed me to easily lift the entire front 3/4 of the frame. This not only made getting in and out a breeze, but also greatly simplified the loading of gear. Unlike the rest of the frame, I glued two of the elbow joints in the hinge assembly, as noted in the upper left photo. This eliminates any twisting that could throw the hinge out of alignment. 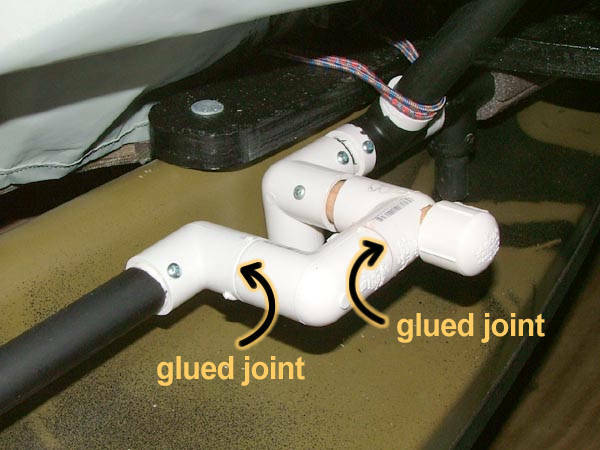 Four elbow joints were used to make the hinge. One of the elbows is a "three-way" elbow, as you can see in the lower left image. The joint that points down has a piece of 3/4 inch oak dowel screwed into it to provide vertical support at that point for when the frame is tilted up like in the photo. Another of the elbows has a hole drilled and trimmed large enough for a piece of 3/4 inch oak dowel to slide through. This dowel is the hinge-pin for the hinge. A threaded pipe cap was screwed onto the end of the dowel to hold the joint together, but by unscrewing the cap, the joint could be disassembled. This allows separation of the front and rear segments of the whole frame without taking anything else apart. To install the hinge on the frame, I simply shortened the side segments next to the vertical supports at the cockpit (as noted in the left photo) and inserted the hinged piece there. It turned out to be a very simple and easy modification. Everything seemed peachy, until I took the boat and cover to Merchant's Mill Pond in Gates County. A thick area of duck weed by the boat ramp meant I had to put the boat into the weed, and take it out at the same place. The duck weed clung to the fringes of the camo cover - not a fun problem to deal with. The real problem was that I didn't dare lift the hinged cover, since the weed would have dripped and made a mess inside the boat. 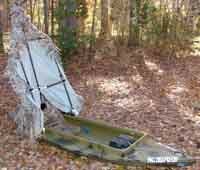 Since the camo cover material does not soak up water, and dries quickly, a little water dripping into the bow was never really a problem. Duck weed on the other hand was a completely different matter. This new problem meant I was again confronted with the initial situation of climbing into the boat without using the hinge. I was back to the awkward and potentially disastrous method of squeezing into the small cockpit opening. I realized there HAD to be a better way. Go to Page Two for "The Redesign".